THE EMERGENCE OF EVOLVING TRANSHUMANOIDS? As part of our online apologetics and discernment labors Apprising Ministries been documenting the New Downgrade within evangelicalism and I’ve been talking about The Build-A-God Shop, a venue where you can come in and share the characteristics of the god of your choosing. Right now there are those furiously building a version of the mush god of mysticism with a man-shaped hole in his/her/its heart; particularly as typified by the Emerging Church aka the Emergent Church, a sinfully ecumenical neo-liberal cult with its new postmodern form of “big tent” Progressive Christianity—a Liberalism 2.0—sometimes referred to by these rebels against the final authority of God’s Word as Emergence Christianity. However, you need to know that these are neo-Gnostic fools who, through their practice of existential corrupt Contemplative Spirituality/Mysticism (CSM), have now unbuckled themselves from the Word of God and have embarked upon their wild goose chase of subjective experience. This is beginning to produce some really rather bizarre ideas such as those I’ve mentioned in The Emerging Church And Transgender Agenda In Elementary Schools and Doug Pagitt Points Us To Evolutionary Evangelist Michael Dowd. Of course this all negates the proper Christian spirituality of sola Scriptura and ends up getting it exactly backward; where the Christian is to measure all experience by Scripture (cf. 2 Thessalonians 5:21), the EC wild goosers interpret the Bible against the what they think they have heard and seen from God in the lifestyle of Jesus. Most of these dire forecasts come from occult, pagan, astrological, astronomical, and extra-biblical sources, such as the I Ching (Chinese book of divination), the ancient Cherokee Rattlesnake Prophecies, the 2012 Solar Maximum, the Zohar, Nostradamus, UFO crop circles, and even Pierre Teilhard de Chardin’s Noosphere (earth’s new evolutionary cycle). By far, the most popular comes from the ancient Maya who base their predictions on an astronomical event tying the precise day that the earth and sun align with the center of the Milky Way galaxy, to the day their long calendar ends: December 21, 2012. Sadly, a few professing Christians have piggy-backed their own predictions on to some of these myths and hysterias, when they should have clung to the Bible alone—especially in light of a doubly exposed, date-setting false prophet named Harold Camping. Tom Horn is a noted author, publisher, and radio host—and is a former Assemblies of God pastor/deliverance minister and one-time Trinity Broadcasting Network (TBN) television host. Horn is also a self-professed “UFOlogist” who displays an inordinate fascination with mythical, extraterrestrial, as well as demonic entities—themes which comprise the bulk of his many books, articles, and audio/visual presentations. Something alarming has been happening since the dawn of time, which has been recorded in the history, holy books, and mythos of every great civilization. Ancient rabbinical authorities including Septuagint translators and early church fathers understood it. Sumerians, Assyrians, Egyptians, Greeks, the Hindus, the America Indians, and virtually all other civilizations throughout history believed it. “vital energy” by ultraterrestrials to form dimensional gateways—whether by manipulating animal, plant, or atmospheric molecular energy—brings interesting questions to the biblical story of Genesis, where some believe superintelligent angels known as “Watchers” descended to earth and used antediluvian cell matter, including women, animals, and plants to construct for themselves “portals,” through which they extended themselves into the material world, bringing with them physical and psychotronic warfare. Note the implication behind this activity in Genesis, “the benei Elohim saw the daughters of Adam, that they were fit extensions” (Interlinear Hebrew Bible, Gen. 6.2). In recent years, astonishing technological developments have pushed the frontiers of humanity toward far-reaching morphological transformation that promises in the very near future to redefine what it means to be human. An international, intellectual, and fast-growing cultural movement known as transhumanism, whose vision is supported by a growing list of U.S. military advisors, bioethicists, law professors, and academics, intends the use of biotechnology, genetic engineering, nanotechnology, cybernetics, and artificial intelligence as tools that will radically redesign our minds, our memories, our physiology, our offspring, and even perhaps—as Joel Garreau, in his bestselling book Radical Evolution, claims—our very souls. 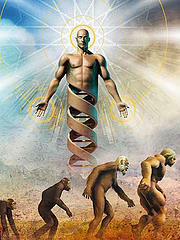 This… series…would not be complete without an examination of the rising science of biotechnology known as “transhumanism.” This high-tech, bio-tech concept is working to create a physical “new breed” of man. There is a mystical component to it that comes from Hermeticism and Theosophy. This represents the ultimate mixture of science and religion..
Transhumanism takes human enhancement further, in morphing the vision of perfect man into a human-machine complex properly called “posthuman”…. The actual work of transhumanism involves technologies such as brain-computer interfaces, neuropharmacology, and perhaps most notably, nanotechnology. Nanotechnology is a molecular science, whose other pursuits range from alternative energy to cancer cures…. You can read this Herescope article in its entirety here.